A couple of nice aircraft to call into Emerald Airport on Tuesday 31 March was highlighted by the visit of Brenzil Dassault Falcon 7X bizjet VH-CRW. 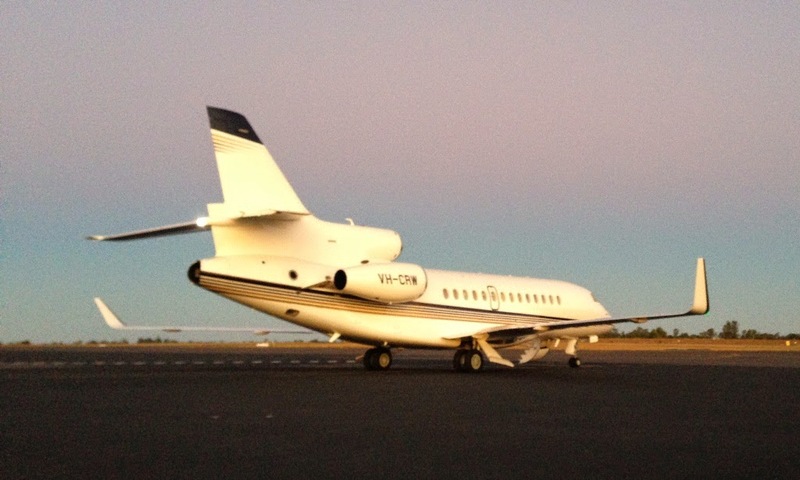 The sleek corporate jet called into Emerald from Brisbane and returning to the capital after dark. Calling into Emerald Airport after dark was the Beechcraft Corporation's own King Air 65-C90GTi N298KA. The smart looking little turbo-prop is believed to be on a demonstration tour of Australia and was on display at the recent Australian International Airshow at Avalon. On Tuesday 31 March, N298KA touched down at Emerald from Bankstown and looked to be staying for the night. A number of other light General Aviation (GA) aircraft have been photographed at Gladstone Airport over the last few days. Here is a nice selection from local plane spotters Jamie and Tash. Surat-based Cessna 182 VH-DII called in on Sunday 22 March. Rockhampton-based Diamond DA 20-A1 Katana VH-CMF was spotted at Gladstone on Monday 23 March. It performed a couple of missed approaches before touching down and dropping off a passenger. Monto-based Beech 36 Bonanza VH-BBD was spotted departing to Agnes Water on Tuesday 24 March. On Wednesday 25 March, locally-based Nixon Communication Cessna 210 VH-NCG was spotted departing to Archerfield. It returned later in the day. Cessna 182 VH-KDZ was spotted departing home to Tully on Friday 27 March. While, also on Friday 27 March, Maroochy Air flew into Gladstone Airport from Hervey Bay and back. And the Royal Queensland Aero Club Cessna 172 VH-DNV touched down at Gladstone late on Friday and departed early on Saturday 28 March. And finally on Sunday 29 March, Mackay-based Cessna 182 VH-FUJ departed home to the Palmyra Airstrip after calling in from there earlier in the week. A great collection of lighties to call into Gladstone Airport over the last week or so, and we sincerely thank Jamie and Tash for capturing these great photos and for taking the time to send them through! An interesting arrival into Gladstone Airport on Saturday 28 March was Cessna 206 Float Plane VH-FKS. The plain white Cessna Float Plane touched down from Coffs Harbour and is reportedly in Gladstone to operate flights for locally-based Air Charter CQ / Australia by Seaplane on transfer flights to nearby Heron Island, as well as local scenic flights. It is registered to Fraser Coast Seaplanes at Tin Can Bay. Of interest, Cessna 210 VH-SOV - also of Air Charter CQ - also flew into Gladstone from Coffs Harbour on Saturday 28 March. It had departed from Gladstone before dawn for Coffs and accompanied the Cessna Float Plane back 'home'. Meanwhile, after landing, the Cessna 206FP VH-PKS was parked on the General Aviation (GA) apron and was soon spotted departing on a passenger transfer flight to Heron Island. 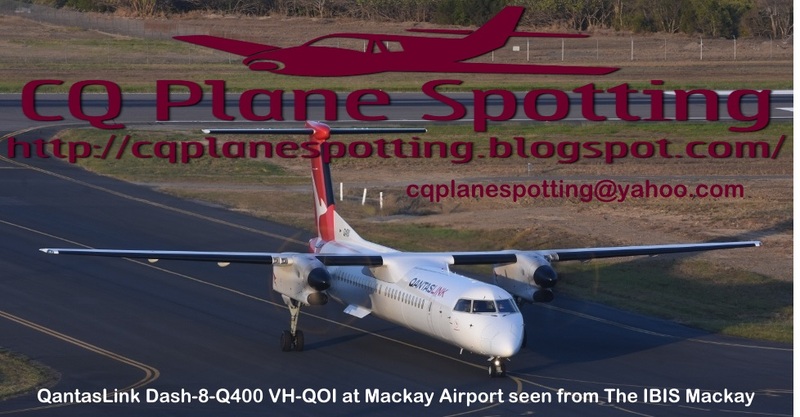 Finally, some reports suggested that the Cessna 206FP may have also been flown into Gladstone to provide back-up to the Air Charter CQ / Australian by Seaplane De Havilland Canada DHC-2 Beaver Mk1 Floatplane VH-IDO which is also based at Gladstone Airport. In fact, VH-IDO was spotted arriving back into the industrial city on Saturday 28 March after a period of maintenance in Mackay. Certainly a couple of interesting movements and a nice new aircraft for Gladstone! For further information or bookings, Air Charter CQ can be contacted on (07) 4972 1940 or 0412 623 554 (mobile). Alternatively, Air Charter CQ can also be contacted via email at holts@tpg.com.au, or you can check out their website at http://www.airchartercq.com.au/. Sincere thanks to local plane spotters Jamie and Tash for capturing these great photos and providing a great coverage from Gladstone Airport!